If your child consistently struggles doing tasks in a timely manner—whether that’s getting her shoes and coat on to leave for school or fill in a homework sheet or take a timed math test—he or she likely has challenges relating to processing speed. Slow processing speed affects many differently-wired children, and can often be found co-existing with neurological differences like ADHD, giftedness, anxiety, and more. 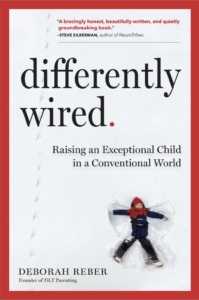 What makes it so difficult for kids to manage and parents and teachers to understand is that there is often a marked disconnect between a child’s intellectual capability and the pace at which they execute certain tasks. Dr. Ellen Braaten is an expert on processing speed issues in kids, and is the author of When Bright Kids Can’t Keep Up, which came out in 2014. In this episode, Ellen explains to us exactly what slow processing speed is, describes how it shows up in kids, and gives her insights on how parents (and teachers) can best support kids for whom this is a challenge. Would you rather READ than LISTEN? Click here to read a blog post of this interview! About Ellen: Ellen Braaten, PhD is associate director of The Clay Center for Young Healthy Minds at Massachusetts General Hospital, director of the Learning and Emotional Assessment Program (LEAP) at Mass General, and an assistant professor of psychology at Harvard Medical School. She received her MA in clinical psychology from the University of Colorado, and her PhD in psychology from Colorado State University. The correlation between slow processing speed and other neurological differences such as ADHD, dyslexia, anxiety, etc.